I ran very early this morning. Instead of running on local streets, I drove over to a 6 mile greenway. I like doing this for a couple of reasons. First, the greenway is always beautiful, no matter the season. And, second, I enjoy running where there are lots of other runners, walkers, and cyclists. Lots of “Good Morning’s,” “Hello’s,” and smiles. Even though I got an early start, it was already pretty warm and very humid. I had put some water in the freezer yesterday. I’m so glad I did. It came in very handy! Also the local running club set up a table on the greenway and was handing out water and Gatorade to people as they passed by. Very cool of them!! I have a friend who has an 80 ft. pine tree in his yard that has died. Rather than wait to see if/when it will fall ( and which direction), I offered to help him take it down. Somehow that offer has turned into a small project. So I spent some time on my greenway run to create a little project plan to cut the tree into firewood on July 7th! I also took advantage of the trail time to look ahead and plan out my week! There is a lot to do this week with work and a trip to New York City with my two youngest children and my cousin. By the time I returned, I had a pretty comprehensive list of items on the checklist for the week. 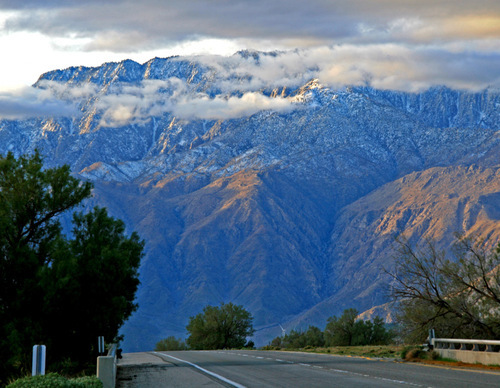 The A2B Route turned north, riding on the outskirts of Desert Hot Springs, California. Desert Hot Springs home to some 80+ ‘Spa-tels,’ a combination of mineral spring spas and boutique hotels. This section provides solitude and beautiful views of San Jacinto Mountain and the Coachella Valley. Great video. I enjoyed it!! I like this little video. I love how this team of film makers tell a story and share a fun experience without words!